I believe in the power of an object. I guess that’s why I continue to make art and often more specifically sculpture. While on residencies in Indonesia I was drawn to Javanese mysticism and the potential for inanimate objects to harbour a kind of soul (similar ideas I’ve read about in Siberian shamanism). I’ve always been drawn to religious or ceremonial artefacts that hold a kind of aura through their use. Often highly decorative, we know these are important objects – they hold an invisible energy. There is an irrepressibly utopian quality to the work of artist Wanda Gillespie. Yet unlike the fantastical and distant utopias imagined in literature and film, Gillespie's utopian evocations materialise as loaded objects in the here and now. You can hold them, caress their forms with your fingers, and often rearrange their components to suit. The artist draws on the power of objects to speak to spiritual or religious experiences. Although elusive, subjective and too slippery to define, what might be said to underpin spiritual experiences are feelings of deep connection – to a God, a spirit, a higher power, the universe, each other, oneself. Gillespie's practice genuinely engages with a broad range of spiritual practices and the objects which are employed as tools within them. Through these objects – and indeed her own – we might seek, and perhaps experience, reconnection. As the artist articulates, such objects can take on an aura. Within the dominant western rationalist-materialist paradigm in which many of us live, the concept of an aura is problematic and disruptive. The possibility of a person, even an object, possessing a spirit or soul – let alone that spirit being perceived by another – is difficult to reconcile with the prescribed realities governing our era. Of course, the potential for belief in an aura is also informed by one's own cosmology, personal experience and subjective knowing. What can more easily be agreed, is that objects used in spiritual or ceremonial practices can take on a perceived power of their own. This may be more apparent within their cultures of use, but is not limited to them. These historical artifacts (and their contemporary heirs) may be widely revered within a museum, yet wield their greatest power when employed inside a church, temple, or other spiritual site or ritual context. Within such spaces, these objects are used to point towards the unseen, and presented as conduits for the divine. As Gillespie points out, their energy is invisible – indeed, it is projected upon them by the viewer. In this sense, these objects' power is cultural: a means of focussing our individual and collective thoughts, beliefs, feelings and desires, which they in turn reflect. Yet this does not preclude the possibility they possess the capacity to contain or channel a real spiritual presence. Perhaps, as my father is fond of saying, in counterpoint to the well-known phrase: you will see it when you believe it. The repurposing of everyday objects to grant them esoteric functions is a recurring strategy in Gillespie’s practice. Central to this exhibition are her abacus works, Higher Consciousness Integrating Calculators, constructed of Walnut, brass, wooden beads, gum nuts, resin, wax and cast concrete. In attempting to count that which cannot be counted, we contemplate the absurdity of measuring spiritual development in numbers. Yet, conversely, the laws of mathematics remain universal even as our understanding expands and evolves. In these recent works, Gillespie adopts the ancient golden ratio to shape her dimensions, foregrounding the profound yet often overlooked beauty of mathematics and its manifestation in nature as sacred geometry. Sacred geometry has historically ascribed symbolic and sacred meanings to certain geometric forms and proportions, determined by observing mathematical principles evident in nature, and predicated on the belief that God is the ultimate geometer. We see this geometry in the example of the Nautilus shell's construction, its growth determined by the Fibonacci spiral which is related to the golden ratio. We also see these geometric principles used in both eastern and western architectural constructions considered sacred, such as churches, mosques, temples, altars, monuments, ancient pagan sites and in some religious art. As such, sacred geometry can be seen as a kind of cosmic blueprint which connects vast scales of time and space to produce harmonious functional and aesthetic relationships. Gillespie's Higher Consciousness Integrating Calculators share this geometry and reference its histories. As contemporary sculptures, they are also capable of direct interaction with their audience, and by moving their carved counters, seemingly infinite iterations are possible within their tight parameters. Further, they can be known through both sight and touch – still a rare quality for art. The cast concrete bases further ground the abacuses in a contemporary context, while nodding to Brâncuși. They may suggest flux and equilibrium, the linear and cyclical. Here they gather in circles as if speaking to one another. Spooky wooden carvings also populate this imagined world, Spirit Forms materialised in solid wood. Presented as mediums, teachers and students of the occult, Octavia, Subtle Being and Spirit Guy have their eyes painted – seers of the unseen. For the artist, they suggest alternate histories, or even possible futures. I have often been interested in the human energy field and the possibility of seeing thought forms in space. spirit-like, but not spirits. I am also thinking about how objects might acquire ‘magic’ energy. Here the artist engages in a dialogue with consciousness and material, with histories of 'spiritual art' and the present moment. Higher Thought Forms also engages aspects of the spiritual in twentieth century modernist abstraction, aspects often misunderstood or even repressed in their earlier art historical interpretation. In Higher Thought Forms 1 her gold and magenta brush strokes appear to float in space, painted inside recesses carved in to the surface of the wood, and over finer markings in a subdued palette of black, white and green. Their rendering has liberated them from representation, yet their orientation, grouping and hue suggest both form and energy: an ambiguous human head at once facing the viewer and seen in profile, an open fire, a swarm of insects floating on invisible currents of air. The work hovers like a thought perpetually taking shape or dissolving back in to formlessness. Gillespie foregrounds the potential of contemporary art to engage, evoke, even channel the spiritual – through artist, object and audience – and without retreating to a singular theological framework to justify or bolster it. Instead, her practice gently points to the limits of rationality and the intellect to provide, and account for, the experiences we may value and long for the most. In this sense, art will always possess the capacity for magic. Wanda Gillespie, Email message to author, February 5, 2019. Gillespie's use of native trees such as Sheoak, Banksia nut, Kauri nut and Punga also reflect her positioning in the Asia Pacific region. 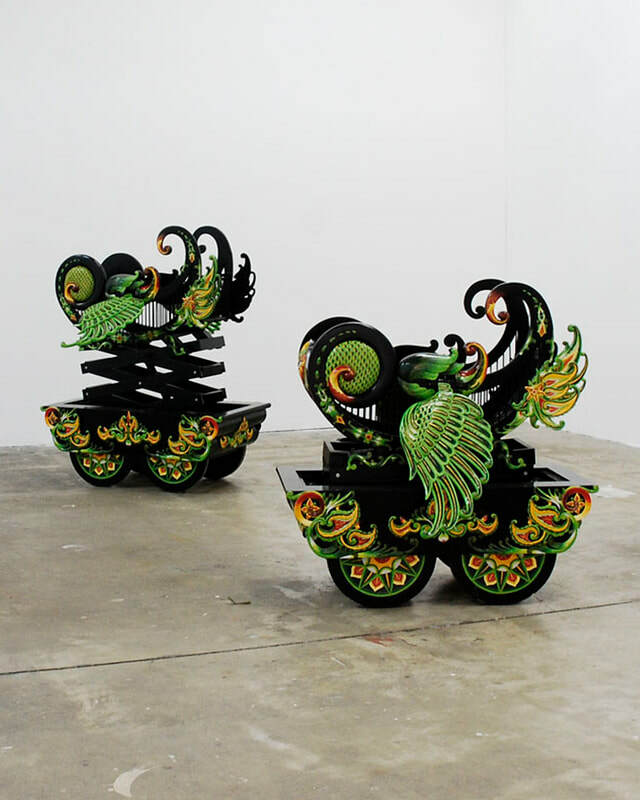 Further, her use of timber reflects the influence of residencies in Asia, working collaboratively with indigenous practitioners in Java and Bali, and learning from their traditional carving techniques. 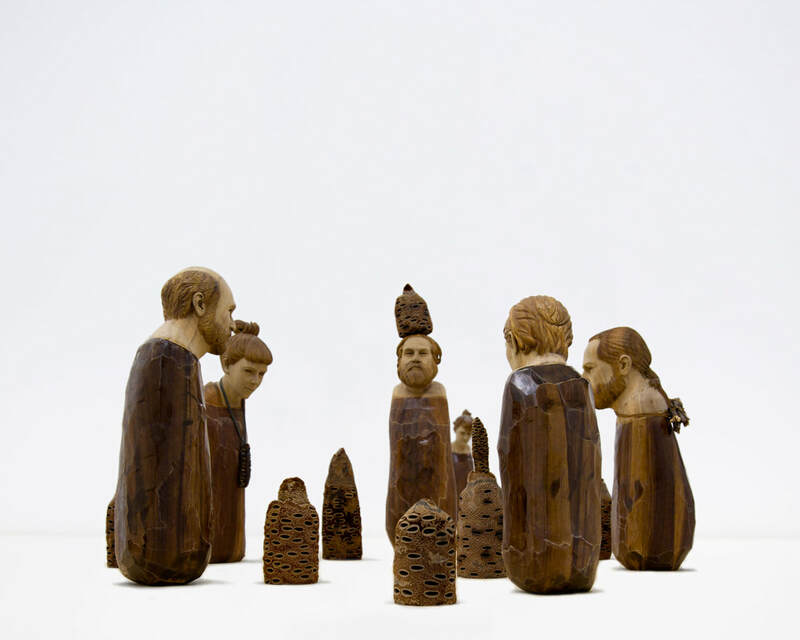 The artist has also studied at the Melbourne Guild for Fine Woodworking under master carver Ronnie Sexton. Gillespie, Email, February 5, 2019. It had always been there, casually tucked away in the living room. Nobody took much notice of it. A relic of more simple minds and simple times. As a child I had always been drawn to it, as though it held some kind of magic aura in its craftsmanship. Of stories within the rings of its wood; of summers and winters, and determination, resilience to grow during the difficult times of regeneration after the major environmental disaster of 2083. It had been carved by my great great grandmother apparently in the late 2150’s during the time of the Great Regeneration. She had been chosen along with several other artists from (what was left of) the Australasia pacific region, to create this body of work for the ‘High Commission for Human Awakening’, (a group of spirits working on raising the level of human consciousness on the earthly plain). Their assignment was to create figurative wood carved sculptures illustrating methods for levitation practice. Instructing seekers on a path to transcendence from the purely physical dimensions to an integrated existence within the spirit and earthly worlds. It came to be known that through regular mediation and levitation practice, humans would make the necessary evolutionary leaps needed for long term survival. My grandmother recalls late nights in the artist’s studio, watching her mother using archaic chisels and mallets to slowly tap away at the wood, peeling back layers of time and memories. At times she seemed to talk to herself, as she communed with the spirits, or would seem to think deeply while in telepathic communication with the fellow artists working on the project. She was instructed to create the faces of the primary guiding spirits who would assist the changes in the souls then living. The spirits markings and knowledge were strange for people at that time, but slowly the collective conscious took hold, and our earthly ancestors began to understand the many layers of space, time, reality, and the various subtle realms. Higher Consciousness Integrating Calculators were used to assist the seekers in their daily practice, ascending one level, one bead at a time, until like bicycle training wheels, they were no longer needed. The figure lays there almost asleep, balancing between two logs. 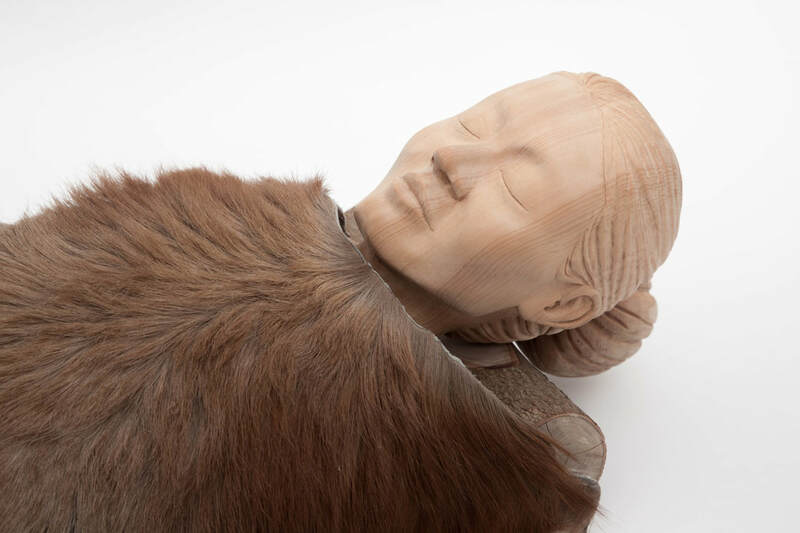 The wood and fur had been so rare at that time it was a marvel, indeed painstakingly created as a precious object of great spiritual importance. As I touched the smoothed wood surface, I felt the messages encoded in the material. Hope and fear for the future, a deep sorrow for the past and regret for the earths’ destruction at the hands of human kind. I saw the sculptures appear in an earlier period, sent in hope of planting the seed of evolution in previous generations. Wanda Gillespie is a fabulist of the highest order. In the past she recreated the world as we know it – not only in the ancient icons she unearthed, but in going so far as to dissect the history from whence they came. She revived buried pagan myths, which carried hints of aged Antipodean and Indonesian archipelago cultures, but in forms previously unbeknownst to archeologists and scientists. Gillespie’s discoveries were, of course, elaborate fantasies which, born as they were replete with archeological field notes, detailed storylines and their own intricate mythologies, bordered on acting as elaborate hoaxes. In those early works an ancient history was unearthed. In her latest foray she has moved to the far not-so-far future to a new, environmentally post-apocalyptic, world where a shadowy organisation known as the High Commission for Human Awakening commissions artists to create totems in order to communicate directly with the human spirit. Levitation Practice is one such futuristic, ritualistic talisman. As always with her work Gillespie accompanies her elaborate carvings with equally elaborate mis-en-scenes. While in the past these have often taken the form of archeological field notes, with Levitation Practice she accompanies the work with an almost wistful reminisce from the period post “the difficult times of regeneration after the major environmental disaster of 2083.” The work, found tucked away in a corner of a lounge room, had been carved by her great great grandmother “apparently in the late 2150’s during the time of the Great Regeneration.” The old woman had been one of the artists chosen by the High Commission for Human Awakening to create these timber conduits in order to access greater understanding of the human spirit: “It came to be known that through regular mediation and levitation practice, humans would make the necessary evolutionary leaps needed for long term survival,” she notes. Gillespie’s Higher Consciousness Integrating Calculators – elaborately patterned abacus’ – may recall the strange sub-genre of Cyberpunk – that of Steampunk, where the future relies on steam power rather than electricity, seen in such novels as The Bats of the Republic by Zachary Thomas Dodson (2015) and The Difference Engine by Bruce Sterling and William Gibson (1990). Or even the real Difference Engine developed by Charles Babbage and Linda Lovelace in the 1800s – a crude and clunky predecessor to todays MacBook Air. But the Higher Consciousness Integrating Calculators were designed to do something far more intriguing than our so-called sophisticated computers are capable of – calculating human spirituality itself. In past works Gillespie has utilised tinkered history, her field notes littered with references to real archeology and the potentially impending shifts inured by global warming. With this latest body of work she has untethered herself from existant terra firma – this is a future all of her own, yet one we can strangely relate to. Gillespie hails from Auckland, New Zealand, a land where indigenous ritual and creativity was clearly a powerful influence. In 2000 she relocated to Melbourne and expanded her interest in Australian indigenous culture. In between she visited woodcarvers in Java and Bali. Creating, in her earlier work, The Antarctic Kingdom of Gondwanaland and the research unit investigating this mysterious world, the Museum of Lost Worlds, and in more recent work the High Commission for Human Awakening, would seem to be Gillespie’s almost desperate attempt to control her own unruly imagination. “There is an interest here in authorship and distancing myself from the work,” she admits. “But also in re enacting recreating, from instructions (from spirits) or bits of information pieced together from the work.” But for such strange creations, sculptural icons that sit outside the realms of fashion and contemporary discourse, Gillespie has clearly caught a nerve. Since emerging from the Elam School of Fine Arts, Auckland University and then in 2009 completing a Masters of Fine Arts at the Victorian College of the Arts, her work has been in high demand. Alongside a ridiculous gamut of awards and residencies she has found a broader audience that are clearly keen to join the Cult of Wanda. But of equal import is the way in which we, the viewer, voraciously consume these icons and objects. They may be fantasies rendered in beautiful timbers, yet we seem to recognise them. Gillespie could just have well titled her kingdom the Museum of Lost Memories, for deeply buried memories they seem to inspire. 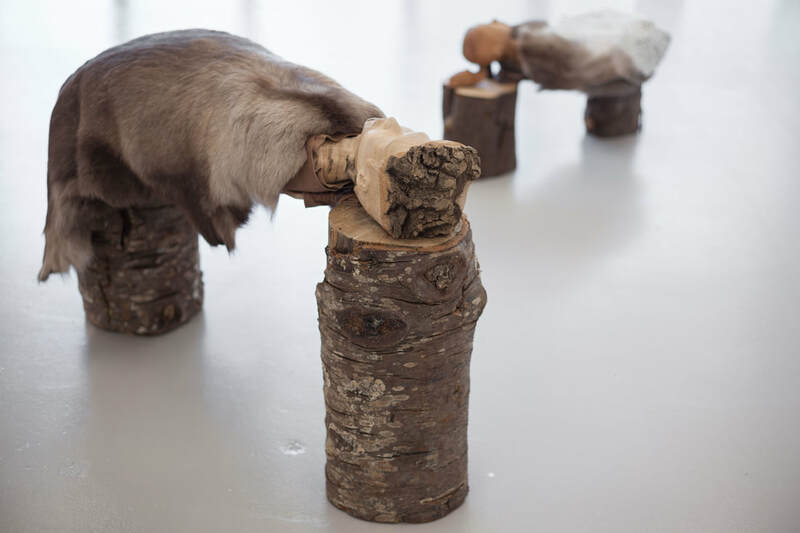 Future or past, rituals, beliefs, ceremonies, births, deaths, celebrations and loss are all carved into these totems as Gillespie attempts to articulate a world beyond language. Very little is known of the small volcanic island, Tana Swiwi, deep in the Java Sea. Many believe it to have sunk in a volcanic eruption 800 years ago. Ancient texts from the royal scribes of the kingdom of Srivijaya, foretold an explosion of stars around the location of the island in roughly 1100 CE. Later, Chinese inscriptions dated sometime between the T'ang and Ming dynasty mention the travels of Yijing, a young Chinese pilgrim who dedicated his life to translating Buddhist text from Sanskrit into Chinese. After many months in the kingdom of San-fo-t'si, he was reported to depart to a mythic island deep in the Java Sea. Little is known of his fate though many propose he reached the island, a half way place between reality and the afterlife where humans fly and inanimate objects take on human or animal attributes. Many local Indonesians propose Tana Swiwi's true nature to be that of the famous Yava Island, a mythic woodland island occupied by immortals. Current researchers believe the island carried the practice of worshipping alternative spirits through the decoration of functional objects. While differing gods are accounted for, it is concluded that they are various incarnations of the one being. The diary of a Dutch colonial settler, amateur archaeologist and Sunday painter, Jasper Van der Velden (b 1801), was found hidden in the wall of an old building in Cirebon, West Java. They present old photographs and texts validating the existence of artefacts from the lost island of Tana Swiwi. Van der Velden served as a key board member on the Commission for the Discovery, Collection, and Conservation of Ancient Objects in Jakarta in 1822, before it eventually disbanded. Most members were fairly amateur; localized and descriptive explanations of artefacts were often accompanied by mythological explanations of their background. A team of researchers from the Museum of Lost Worlds studying the area have now re-created objects from excavated fragments and the decrepit photographs and drawings found in Van der Velden's diary. The re-creation of a traditional Tana Swiwi ceremony indicates one of the objects' possible functions in ritualistic practices. A former secret service agent founded The Museum of Lost Worlds in 2006. While searching for a nameless assassinator, the agent came across documents confirming the existence of a number of forgotten worlds. His position was soon dismissed and he continues to research these lands with a growing team of dedicated geographers and archaeologists in a secret hideout north of Melbourne. Due to the potential mass hysteria caused by the uncovering of these worlds and their controversial nature - the museum, rather than finding a permanent space, exhibits in one off shows (also known as "uncoverings") around the world. Rising temperatures have seen the unprecedented erosion of age-old ice along a mountain chain on the northern coast of Queen Maud Land, Antarctica revealing an archaeological treasure trove. Remnants from an instinct culture have been excavated and are now being reviewed and carbon dated by researchers at the Museum of London. The painstakingly crafted objects recovered from three initial archaeological missions suggest the culture may have been a precursor to such modern-day indigenous cultures of the South Pacific as Maori, Aboriginal Australian, Polynesian and East Indonesian. The uncovered objects can be viewed as the so-called ‘grandmother' of present tribal art and share similarites in design motifs. Speculation abounds that this ancient culture may have developed simultaneously, yet independently of the dominant ancient civilizations in Sumeria and Egypt, and flourished on the lands of the southern super continent, Gondwanaland. The latest findings are beginning to challenge the belief that Antarctica has been under ice for a million years. The discovery of the controversial Piri Reis map in 1929 - a 300 hundred year old map which detailed the northern Antarctic coast from under the existing ice, was the first clue to this scientific inaccuracy. Geological evidence confirms that the latest date Queen Maud Land could have been charted in an ice-free state is 4000 BCE, raising questions about the map's origins and established scientific ‘truths' about Antarctica's ice age. It is believed that the oncoming ice age, with a revised date around 3500 BCE, played a tragic hand in eradicating this ancient culture. While the majority of people possibly the lower rungs of the society (be it agrarian workers) are assumed to have fled the areas of Queen Maud Land prior to a major freeze. The relics, collected and reassembled here, are attributed to a reigning religious class; they enact a spiritual drama of perhaps both fear of the impending end and the desire for transcendence. Rudimentary skis were among the icy findings at the site. The nature of the design and the amassing of these objects at specific locations hint that these were produced for a ritual purpose rather than everyday transport. The position of their discovery, at a significant elevation, on the 70th parallel closest to South America, is crucial to the idea that the remaining inhabitants chose to propel themselves away from the earth that had betrayed them. A swing-like structure, again ritualistic in design, stood on the precipice of this chosen site facing a panorama of limitless sky. The standing hypothesis is that this was used as a device by the faithful to swing into the void of heaven and thus cross through the fabric of time and space, that is to say, cross the threshold of reality. Scholars have drawn links between the apparent voluntary suicide of these ancients and the doomsday cults of today. Further excavation at strategic points below the mountain will perhaps shed light on the fate of these lost peoples and whether they indeed experience a final transcendence. As temperatures rise, these initial objects may be the tip of the iceberg, so to speak, of what is to come.